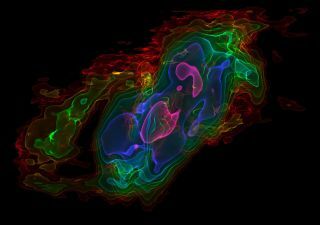 This picture shows a view of a three-dimensional visualization of gas in the nearby starburst galaxy NGC 253 (The Sculptor Galaxy) as observed by the ALMA radio telescope in Chile. It shows huge amounts of gas being ejected from the galaxy's center and will make it hard for new stars to form. Image released July 24, 2013. New observations by a powerful telescope in Chile have revealed clues into why some galaxies experience a frenetic period of rapid star birth, only to see those stellar newborns starve future generations of stars. Scientists studying the artfully named Sculptor Galaxy found that as its stars are born and die, they blow away the rich gas material needed to create more stars, blasting it out of the galaxy, possibly forever. "Sometimes it is easy to see a faint object if it is by itself, but much harder if it is in the midst of a complex background," lead author Alberto Bolatto of the University of Maryland in College Park told SPACE.com by email. The giant radio telescope ALMA changes the game. "It can recover small, faint details in a bright, complicated structure," Bolatto said, adding that it allows scientists to study the previously hidden molecular gas. Lying 11.5 million light-years from the sun, NGC 253 is the closest starburst galaxy or our own Milky Way. Its position in the southern sky makes it an excellent target for ALMA. The team was able to make headway with only 16 of the antennas available in the telescope's first cycle; ultimately, ALMA will encompass 66 antennas. This comparison picture of the nearby bright spiral galaxy NGC 253, also known as the Sculptor Galaxy, shows the infrared view from ESO’s VISTA Telescope (left) and a detailed new view of the cool gas outflows at millimeter wavelengths from ALMA (right). Image released July 24, 2013. Stars form from rich gas that falls together as gravity compresses the material. But when packed together, the young stars are violent. Previous observations of the Sculptor Galaxy revealed "superbubbles," expanding shells of gas around clusters of thousands or tens of thousands of bright young stars. Streams of gas flow out of the superbubbles, eventually traveling to the outer edges of the galaxy. "These bright stars have strong winds coming from their photospheres, which push against the surrounding molecular cloud from which they formed and start inflating a bubble," Bolatto said. The stars live short, bright lives, shining far stronger than the sun but lasting only a few million years before dying a violent death. When they explode in a brilliant supernova, they provide a strong shove that pushes the gas away from them. "We think that the molecular gas gets its first 'kick' in this manner," Bolatto said. "Once it gets high over the plane of the galaxy, it is picked up and 'hitches a ride' with the hot wind." Depending on how far the gas travels and how fast it gets, it may find itself recaptured in the galactic halo, the diffuse extended material that surrounds galaxies. Eventually the gas falls back to the interior of the galaxy, where it may be turned into stars. But it could take millions of years before returning. Fast enough winds could carry the material out of the galaxy entirely, taking the fuel to form the next generation forever out of reach. The hot ionized winds streaming from galaxies like NGC 253 shine brightly, and scientists have been studying them for nearly a decade. But these winds are tenuous, and can't carry the mass astronomers suspected was leaving. "Molecular winds can be much colder—tens of degrees Kelvin—and denser, and as a consequence, they can move a lot of mass," Bolatto said. The cold winds were fainter than their hotter companion, and required an instrument like ALMA to pick out. Previous work on the galaxy indicated the presence of a cold gas wind, making it an excellent object to study. The research is detailed in the July 24 online version of the journal Nature. The VLT Survey Telescope (VST) has captured in sharp detail the beauty of the nearby spiral Sculptor Galaxy NGC 253. This new portrait is probably the best wide-field view of this object and its surroundings ever taken, officials say. Studying the carbon monoxide molecules in NGC 253, Bolatto and his team were able to determine that as much as nine solar masses—nine times the mass of the sun—streamed away from star-forming regions. At such a rate, the galaxy would burn through its supply of gas within the next 60 million years. Trapped in a vicious loop, the stars speed their way through their rapid formation period. As star formation ramps up, more gas is kicked out. When enough material is removed, the stellar formation rate will slow, as will the amount of cold gas tossed from the system. "But by then, the damage will be done," Bolatto said. "A lot of the material that would otherwise have gone into forming stars will be on its way to the halo of the galaxy, or leaving it. So those stars will never form, or maybe form much, much later, slowing down the growth of the stellar mass of this galaxy." Today, the ALMA observatory boasts 66 12- and 7-meter telescopes, and Bolatto and his team already have time on the full telescope to perform follow-up observations on NGC 253. They also intend to study other galaxies likely to boast cold molecular winds. "My collaborators and myself would like to understand how the universe came to be like it is today," he said. "That requires understanding better how galaxies form and evolve."